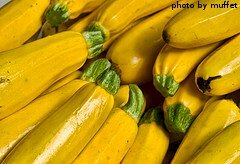 Summer Squash Varieties - What's the Difference? There are several different summer squash varieties available to the backyard vegetable gardener. Most varieties are similar in taste and texture. The variety you choose is really just a matter of personal preference. Some people prefer straightneck varieties because they are easier to slice uniformly. Some people prefer crookneck varieties for stuffing. Other folks like the look of the scalloped/patty pan varieties. The choice is up to you. 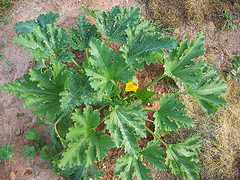 All varieties of summer squash are grown on similar plants in similar soil conditions. Straightneck Varieties - these summer squash are easy to identify - they have a straight neck. 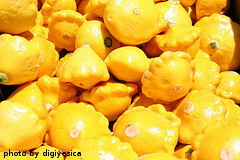 Most are yellow in color and are harvested when they are 6-12 inches long. 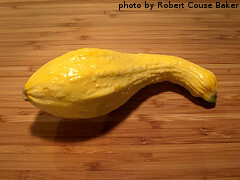 Most varieties of straightneck squash are almost cylindrical in shape. Crookneck Varieties - these varieties are also easy to identify - they are curved at the top. They are egg shaped at the bottom with a tapered, narrow neck. Most crookneck varieties are yellow in color and are harvested when they reach about 6 inches long. Some varieties have a smooth skin, while others have visible bumps. Scallop/Patty Pan Varieties - these varieties of summer squash are more unique and resemble minature flying saucers. They are usually yellow or green in color and are harvested when they reach 3-4 inches in diameter. These varieties usually have a slightly nutty flavor and are prized by professional chefs for their rich taste and unique shape.